Our time in Jaisalmer was well spent but we grew weary of dodging Diwali fireworks and scooters racing through the narrow alleyways. Thankful to escape with all of our limbs intact, we boarded the train bound for Jodhpur. For this second Indian train journey we’d paid a few dollars more and upgraded to air conditioned second class, which was money well spent given all the desert sand that flew in through the open windows on our first trip. The seven hour journey passed quickly as I read and Jason chatted with a friendly local who had been in Jaisalmer for work. Like many of the Indians we encountered, he was eager to chat and offered interesting insight into Indian life and culture. 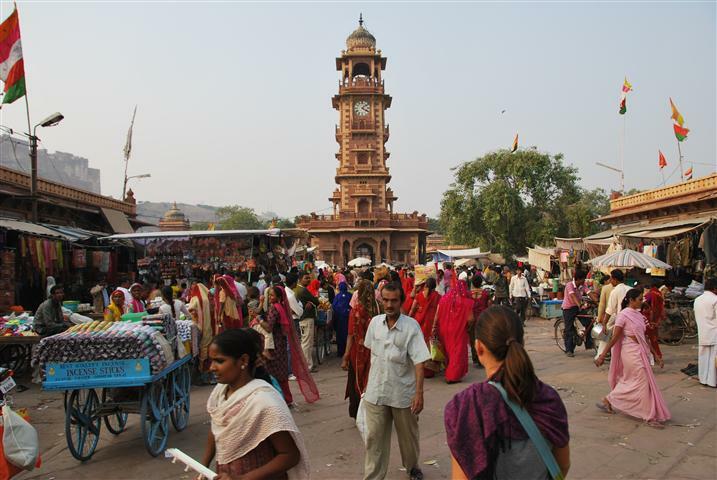 We rolled into Jodhpur’s train station just before midnight and were a bit surprised to find that it was jam packed with people. Stepping over the sea of sleeping bodies, we felt grateful to have a hotel room waiting for us. 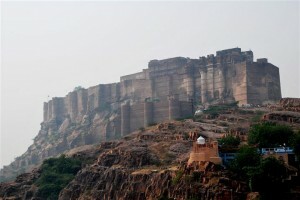 Like Jaisalmer, Jodhpur is located in the state of Rajasthan. Known as the Land of Kings, practically every city is home to a medieval fort or Maharaja’s palace. 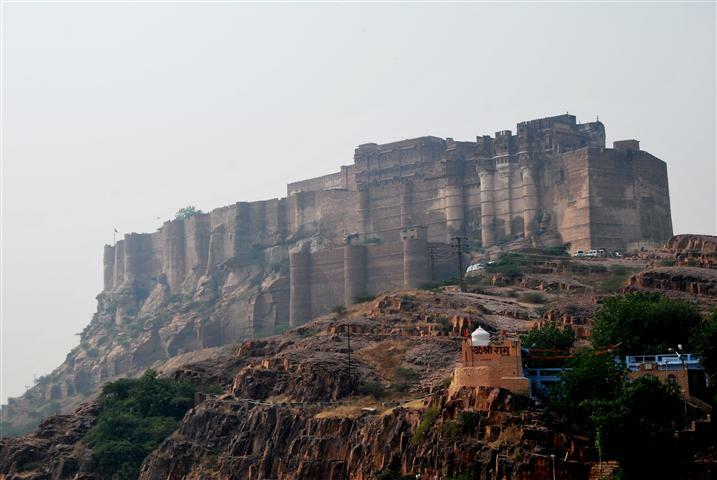 Jodhpur’s Meherangarh Fort is known for being one of India’s best so we set aside one day to visit this scenic fort perched on a cliff 400 feet above the city. Reached by a steep, winding road, the fort is filled with multiple palaces known for their intricate carvings and expansive courtyards. Knowing that we tend to enjoy historic sites more when we actually learn something, we armed ourselves with the optional audio guide and began our journey through the fort. The quality of audio guides tends to vary greatly but we found this particular one to be both informative and entertaining. As we meandered through the massive fort listening to stories about the palace’s former inhabitants, we admired beautiful architecture and a treasure trove of paintings, portraits, weapons, textiles and palanquins. Setting aside time on our whirlwind tour of Rajasthan to visit this historical site was more than worth it. After leaving the Fort, we set off in search of food. Drawn to a restaurant packed with locals, we refueled with an Indian thali (a selection of different dishes served in small dishes on a round tray) and proceeded to spend the rest of the day getting lost in the city’s winding streets. 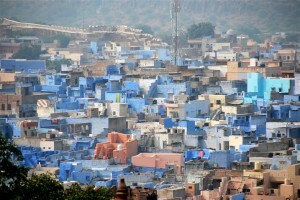 Known as India’s blue city, Jodhpur has a large number of buildings painted light blue to deter insects and keep them cooler during the hot summer months. 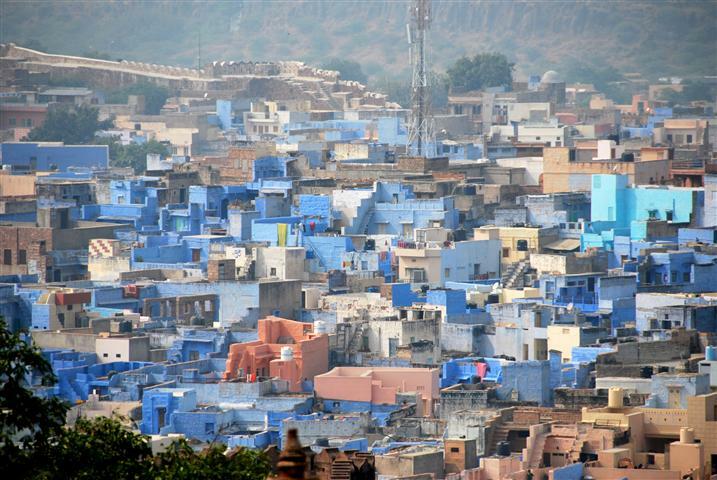 I don’t know if there is any scientific evidence to back this up but the blue buildings do contrast nicely with the brightly colored saris worn by many Indian women. At one point when we felt we might go crazy from the incessant honking and constant stream of vehicles, cows and pedestrians, we took refuge in a quiet courtyard. In India especially, these little re-fueling breaks are often what got us through the long days of sightseeing in excessively crowded, noisy places. 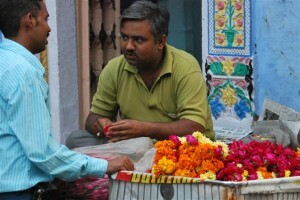 After Jodhpur, the next stop on our itinerary was Udaipur, known by many as India’s most romantic city. Having heard so many good things about this Rajasthani gem, we included it on our itinerary despite the fact that it is not connected to Jodhpur by rail. Other travelers had warned us about bus travel in India and as much as we were hoping to avoid a long, bumpy, crowded and uncomfortable trip, we had no choice. We briefly considered hiring a private driver but couldn’t justify paying nearly ten times as much for a six to eight hour trip. Foolishly we assumed that the bus trip couldn’t possibly be that bad. 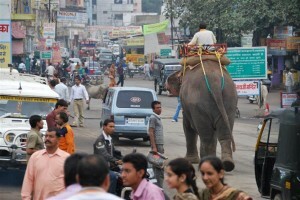 The morning of our departure, I spoke naively of “experiencing the real India,” while Jason stared at me skeptically. Cautiously optimistic, we headed for the bus station and climbed aboard the bus. Fortunately our assigned seats actually existed and were not located in the upper level cramped sleeping compartments. Like many bus rides taken throughout our trip, this one quickly went from uncomfortable to miserable. Every time the bus picked up speed and it felt like we had the potential to make progress, it would come to a screeching halt and multiple people would climb aboard. Once the seats filled up, people began to wedge themselves into the aisle and the sleeping compartments. Adding insult to injury was the sight of vomit streaming down the sides of the windows as people in the upper level compartments battled with motion sickness. While we certainly felt bad for them, Jason and I were dealing with issues of our own. That morning, in preparation for the long bus ride, we had limited our water consumption. Despite drinking next to nothing, we both had to use the bathroom and we grimaced every time the overflowing bus hit one of the many bumps in the dirt road. After nearly four hours of being tossed around, the bus finally made a pit stop and we took turns elbowing our way down the aisle and relieving ourselves behind a bush. Our bladders empty, we threw on our headphones and spent the last four hours of the bus trip trying to escape to the “happy place” in our heads. No matter how annoyed we felt by the bus trip, I couldn’t help but feel even more annoyed with ourselves. The cramped aisle was bursting with young children and older women who were a lot more uncomfortable than us. Despite their situation, no one was complaining; in fact they seemed relaxed and patient. Clearly they were able to look beyond their discomfort and realize that things could be much worse. We had been reminded of this nearly every day on our around the world journey, but we obviously still had a lot to learn.